So you want a laptop that turns into a tablet. No kidding! Plenty of people are jazzed by the idea of having a slate for sharing, plus a solid keyboard for typing. And the new Asus T300 Chi sure looks like a great pick: for just $700 you get a great looking PC that—both halves combined—is thinner than a MacBook Air. But that’s not quite the whole story. Updated 4/9/15 with some thoughts about the cheaper 1080p version. A 12.5-inch Windows 8.1 tablet which docks right into a Bluetooth keyboard base, letting it transform into a clamshell laptop whenever you need. It comes with 64GB or 128GB of storage, 4GB or 8GB of RAM, and a Intel Core M processor that doesn’t need a fan. Asus has built a following for these detachable computers, but this one’s a bit different than previous Transformers. There’s no extra battery, hard drive, or full-size USB ports in the keyboard base, nor any mechanical buttons you need to press to undock. The base merely props up the tablet with a pair of protrusions and some strong magnets, and you can rip out that tablet anytime you want. When it comes to looks, I’ve gotta hand it to Asus—this portable machine looks pretty damn good. It’s honestly hard to believe this carefully crafted aluminum-clad convertible costs just $700. I love the way the shiny beveled edges catch the light, giving the outline of the laptop (and the trackpad) a brilliant sheen at just the right angles. It’s subtle enough to justify using the device for work, yet ostentatious enough to turn heads. And it’s pretty awesome that it actually looks like a laptop right up till you surprise people by ripping the screen out of its hinge. 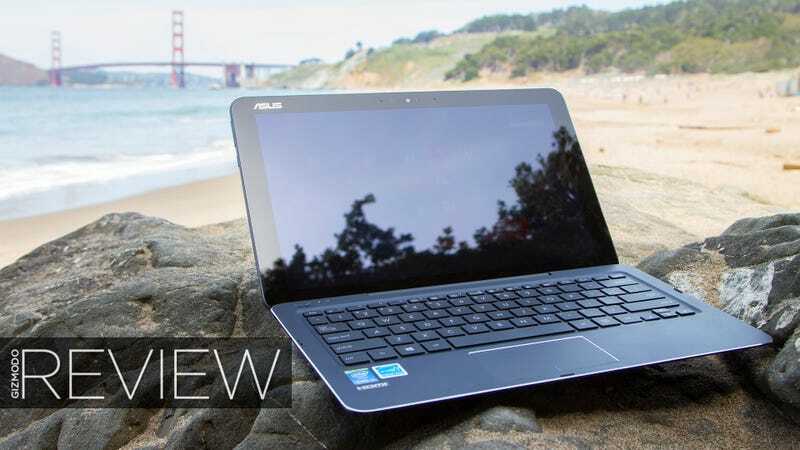 Previous Asus Transformers had a pretty major bulge at the bottom to stabilize the screen and facilitate the mechanical connections that hold it in place—which was a dead giveaway—but the T300 Chi shrinks that bulge dramatically thanks to a simplified magnetic system. Those magnets are strong, too, strong enough that there’s practically no way the tablet or keyboard will accidentally detach. I grabbed the slate portion and shook, vigorously, but couldn’t get the keyboard base to separate from the tablet. Of course, that also means it’s not exactly effortless to remove the tablet portion when you actually want to, but it can be done with one hand. Just grab it by one side, with your forearm pressed right up against the dock, and lift up with your wrist. And of course, the magnets help the pieces snap right back together again. So it looks good, and the magnets hold up, but is this design practical? I’m not at all convinced of that. Despite the fact that the T300 Chi’s tablet section is pretty damn thin and light for a Windows tablet, it’s still got some considerable bulk. It makes the laptop configuration prone to tipping backwards if your lap’s at an angle. And I don’t know about you, but a 12.5-inch tablet with an oblong 16:9 aspect ratio feels pretty awkward to heft. I do like watching 16:9 movies horizontally, and scrolling through webpages vertically, but I rarely felt the need to remove the tablet from the keyboard to do that—and every time I did, my arms got tired of holding it. And in order to have such a thin tablet magnetically connected to a base, you’re giving up an awful lot. There are no full-size ports anywhere on this machine-only micro-USB 3.0, micro HDMI, microSD for expandable storage, and a 3.5mm headset jack port. There’s simply no room for anything larger on the tablet, and the lack of a docking connector means the keyboard base can’t hold them either. The only port you’ll find on the base is microUSB for charging up the Bluetooth keyboard. Want a full-size USB? You’ll have to carry around a (bundled) dongle. On the plus side, that keyboard is excellent. Way the heck better than you’d think for a machine this price and size, particularly when a number of Asus’s pack-in keyboards have been of the utterly cheap variety. It’s fast, precise, the keys have a reasonably deep throw, and they’re all cushioned properly. I’m typing this whole review on the T300 Chi’s keyboard, and so far it’s been an absolute breeze. The touchpad also feels surprisingly good at first blush—a slick surface, fairly quick two-finger scrolling and zooming—but it is pretty damn tiny and extremely stiff to click. Overall, it’s passable, but I can’t say I actually enjoy using it. Actually opening and closing the laptop can be a little finnicky too. There’s not much to grab onto to help pry the lid and base apart, and while I’ve never needed to step in to make sure the Bluetooth properly pairs, there is a slight delay before you can use the keyboard and touchpad every time you wake it from sleep. Putting it to sleep by closing the lid isn’t completely foolproof either. While it usually works properly, there was one occasion I closed up the laptop and stuck it in my bag, only to find the chassis disturbingly warm when I pulled it out again. The computer had stayed awake in my bag the whole time instead of going to bed. Of course, it probably would have been warmer if it had a full-blown Intel processor. The T300 Chi is one of a very few new products—including Apple’s new MacBook—using an Intel Core M chip. It’s a lower voltage processor designed specifically for thin fanless computers. I’ve tried a couple of them so far, and I’ve gotta admit I haven’t been all that impressed:with the Lenovo Yoga 3 Pro for example, I got a slightly slower experience than with a normal Intel Core processor, yet no more battery life for my trouble. The only upshot was having a thinner machine, and in the case of the Yoga it didn’t feel like enough of a trade. So how does the T300 Chi stack up? I tried the $900 model with the 1.2GHz Intel Core M-5Y71 CPU, 8GB of RAM and a beautiful 2560 x 1440 screen... and honestly, it’s about the same. That Core M definitely capable of handling any single general purpose computing task you throw at it—even a bit of multitasking—but the Chi is no Core i5 machine. I saw a decent amount of stuttering when I tried to run my usual hefty collection of Chrome tabs, and the computer doesn’t seem to have enough graphical muscle to pipe steady video over that micro-HDMI port to a connected TV. And for some reason everything—I mean everything—starts stuttering when the Chi’s battery is on its last legs. Which reminds me, I’ve saved the worst news for last: I repeatedly saw just over three hours of battery life from the super-high-res Chi in the real world, and four hours from a more standardized test. If, like me, you plan to use this computer to browse the web in Chrome, watch a little YouTube, do a little Gmail, and get some writing done with the screen set to a reasonable 50-60 percent brightness, that’s all you can expect to get with the $900 model with the super-high-def screen. If you go 1080p, you’ll likely last a bit longer, but I doubt you’ll get past four, four and a half hours unless you shy away from multitasking. Update 4/9/15: Actually, we repeatedly got right around 5 hours, 10 minutes with the 1080p model in our standardized test. That’s not class-leading, but not bad either. And while the 2560 x 1440 screen definitely looks a little crisper, the 1080p one is quite nice, better than you might expect on a $700 machine. I still can’t wholeheartedly recommend this machine, but it’s a way better deal. The least expensive computer I’ve ever used that made me feel like a high-powered executive. Yes, that’s a backhanded compliment—but it’s still a compliment! This machine looks good, and it looks professional. Seriously great typing experience for a machine this thin. I would totally buy this keyboard base for a different, more capable tablet. Not a fan of the tiny arrow keys tho. You can turn the tablet screen around and mount it the other direction to prop it up on cramped airplane tray tables. Great for movies with headphones. The speakers sound like a bad joke. So. Ridiculously. Quiet. The primary reason I like tablets is so I can stick that screen right up in my maw while watching movies and catch every last detail. But I can’t even make out dialogue with this poor excuse for a sound system. Three hours of usable battery life is a dealbreaker for the super-high def model. Maybe you keep your laptops and tablets plugged in all the time, but I don’t. You’ll definitely want to check out the 1080p model even if so. What’s up with all the stickers, Asus? I count seven of them obscuring your beautifully constructed aluminum frame. The rubber feet on the bottom of the hinge peeled off right away and I never saw them again. No. You may like the idea of this computer, but I doubt you’ll appreciate the reality—not when your money could be so much better spent. If you want portability and performance, you can get it in a thin Core i3 or i5 laptop like the $800 Dell XPS 13, or a backflipping touchscreen machine like the HP Spectre X360 (we’ll have a review soon) for $900. Both are stylish and thin, and while neither has nearly as much battery life as they claim, both go longer than the Chi while offering full-size ports and stutter-free experiences. The only reason to go Core M is if you want ridiculously thin, and yet the T300 Chi isn’t thin enough to overcome the disadvantages. But if you keep waiting, I bet that sooner or later, the detachable transforming laptop of your dreams will indeed appear. Today’s Core M might not be right, but tomorrow’s will surely be better. Apple just showed the entire industry how to cram a day’s worth of Lithium-ion batteries into a razor-thin laptop. We’re on the verge of ditching all those stupid miniature ports for sensible USB Type-C instead. And companies are working on wireless tech that could allow a keyboard dock—like this Chi’s keyboard dock—house the ports and battery that it’s missing. So no, I don’t think you’d be totally happy with the T300 Chi unless you’re a very specific individual with very specific needs. Next year’s Chi, though? It could be pretty damn amazing.